According to the U.S. Energy Information Administration (EIA), more than 30 percent of the nation's electricity consumption is used to power HVAC and refrigeration systems; a significant portion of that energy is delivered to the fans in those systems. ebm-papst, a manufacturer of fans, motors and drives for these and other common applications, is developing energy-efficient air transfer units, helping to keep our living spaces, food, and beverages cool, while reducing energy waste and utility bills. The company's focus on GreenTech and sustainability permeates through its product lines as well as its corporate philosophy. Engineering.com spoke with ebm-papst engineers, who provided an overview of the technology that makes their fans efficient, affordable, customizable—and good for the ecosystem. Over a century ago, two inventors had different ideas about the ways in which electricity could power the world. Thomas Edison wanted to sell incandescent light bulbs; he favored direct current (DC) generators and motors. His rival, Nikola Tesla, invented the induction motor, which runs on alternating current (AC). Each motor has its pros and cons. DC motors are highly efficient at any speed and their speeds are easy to vary, but due to their use of brushes and commutators, they tend to have short lifespans. AC induction motors don't use brushes, making them more durable and cost-effective. Until recently, AC motors only operated at a single speed (a function of the line frequency), but modern variable-frequency drives (VFDs) now allow AC motors to operate at multiple speeds, although they're inefficient at the lower end of the range. The best of both worlds is the brushless DC motor, which uses electronic control in place of the brushes and commutator, allowing motors to operate efficiently at multiple speeds while reducing the friction-based wear-and-tear of brushed motors. Because they substitute electronics for brushes and commutators, they're often referred to as electronically commutated motors, or ECMs. In effect, ECMs are brushless DC motors, but where typical brushless DC motors operate strictly on DC, ECMs have AC to DC conversion circuitry built into them, so they run directly off of AC line voltage. Because ebm-papst motors accept AC inputs, engineers can easily retrofit them into designs that once used AC fans. In fact, their form factors are identical, making them suitable as drop-in replacements. They also make fans with DC inputs for new product lines, running off of 24 VDC sources that are compatible with the LED lighting systems used in many refrigerated display cases. AC or DC, these fans are eco-friendly in both manufacturing and operation. ebm-papst is dedicated to making all new products better than their predecessors in terms of economy and ecology. As such, they manufacture fans that integrate the motor, control circuitry, and fan blades into a single unit, which reduces the amount of material and energy used in their production. According to ebm-papst, "a combination of metal and plastic elements in the axial and centrifugal impellers makes them particularly light and offers potential for optimum aerodynamic design, culminating in a previously unattained level of energy efficiency – in conjunction with improved acoustics." While lighter materials and optimized aerodynamics can improve mechanical performance, electrical efficiency comes in part from the ability to vary the fan speeds, whose parameters are custom-programmed for the particular application at the time of installation. 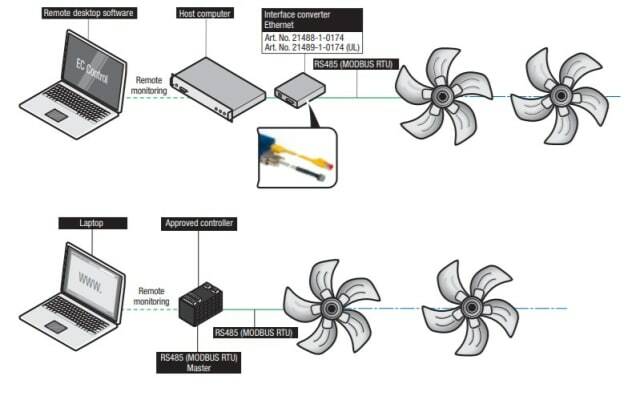 Systems with multiple fans can optimize their efficiency and temperature control by connecting all fans to a master controller. 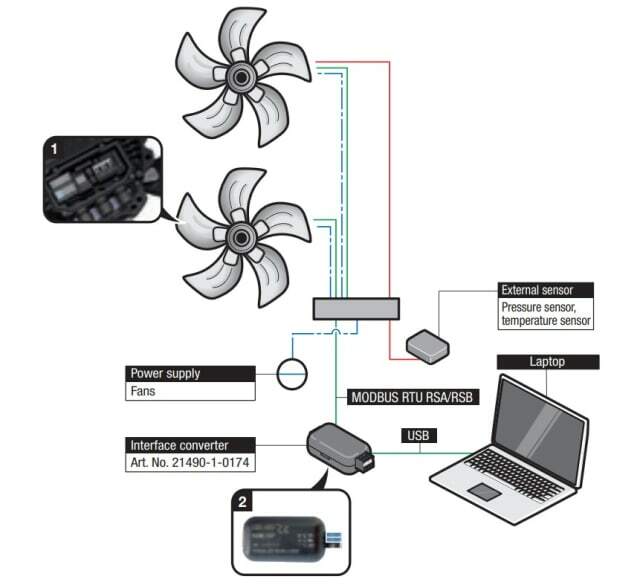 Based on feedback from each fan's external temperature sensor, the controller can increase or decrease individual fan speeds to ensure equal cooling over multiple zones. The net result of individually-controlled, multi-speed fans is a significant decrease in energy consumption. The company's fans exceed the European ErP directive for energy-related products, thanks to a combination of sustainable manufacturing practices and higher efficiency. 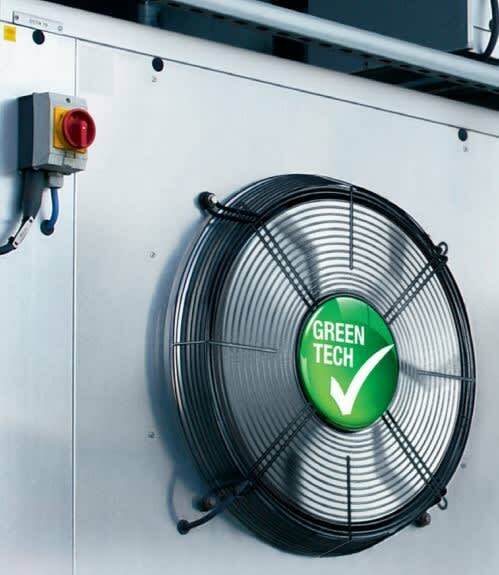 A GreenTech fan can include built-in power-factor correction, EMI filtering, thermal overload protection, current-limitation, line voltage and phase failure detection, an electronic commutator, motor soft start circuitry, and an RS-485 Modbus connection that provides a programming interface and integration into multi-fan systems. The fan also features a programmable PI controller that allows engineers to adjust the proportional and integral coefficients, although ebm-papst engineers say that the majority of their customers find that the preprogrammed default values work well. 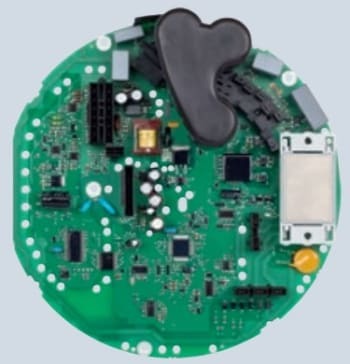 Additional sensors measure fan speed, voltage, current and bus communication, which allows the master controller to monitor fan status, detect faults and alert a technician if necessary. HVAC systems may alter fan speed based on the time of day, room occupancy, environmental conditions and virtually any other variable that can be tracked. Monitoring equipment at the machine level is yesterday's news. Thanks to the Internet of Things (IoT), devices can be observed and controlled from anywhere. As part of the GreenIntelligence initiative, ebm-papst incorporates IoT technology and a Modbus interface into its fans, allowing them to be integrated into a building automation system (BAS) as part of comprehensive energy-management and machine maintenance programs. Either interface allows a facilities manager to observe parameters such as operating hours; fan speed; current; voltage; power consumption; emergency operations; temperature of the motor, electronics, and power circuitry; operating mode (temperature or pressure/airflow control); setpoint; temperature feedback; and alarm signals. Different RS485 adapters such as Bluetooth, USB or ethernet can be used to make the connection between fans and smartphones, laptops or computer networks. Through a variety of attached sensors, an IoT fan can detect a failure and send an error code to a technician, minimizing downtime. Of course, avoiding a failure is better than detecting one, so the BAS can also track the number of hours that the fan has been operating, which assists with preventative maintenance. Even better, sensors can detect conditions that may produce a fault in the near future, facilitating predictive maintenance. Environment – minimum and maximum ambient temperatures, dust/moisture/spray water, etc. Is a master controller needed? If so, what type? Is the master controller compatible with ebm-papst fans? Field engineers at ebm-papst will work with client application engineers to design an optimal configuration of fans that strike a balance between performance, cost, and efficiency. As the fields of renewable energy and sustainability continue to grow, we're finding that being green and saving some green are no longer mutually exclusive concepts. Energy-saving devices such as LED bulbs, low-power electronics, and efficient fans demonstrate that products that make good ecological sense also make good economic sense, and that's a lesson that's right on the money! Learn more about ebm-papst GreenTech EC fans. Images and videos courtesy of ebm-papst.